Home Mortgage How do interest rate changes impact your repayments? How do interest rate changes impact your repayments? An essential part of the home buying process is shopping for a home loan with a competitive mortgage interest rate. It is important to know that when you take out a home loan, you will actually be paying a lot more than what you borrowed. To give you a little perspective, imagine borrowing a $150,000 with a 5.5% interest rate over 30 years. The total interest that you will be paying for the rest of the life of the loan is actually bigger than the loan itself at $156,000. There are several considerations you have to consider when looking at home loan rates. After all, your hard-earned money is at stake here, and it pays to educate yourself about how even a subtle increase in rates would affect your payments. A little rate adjustment means a lot. 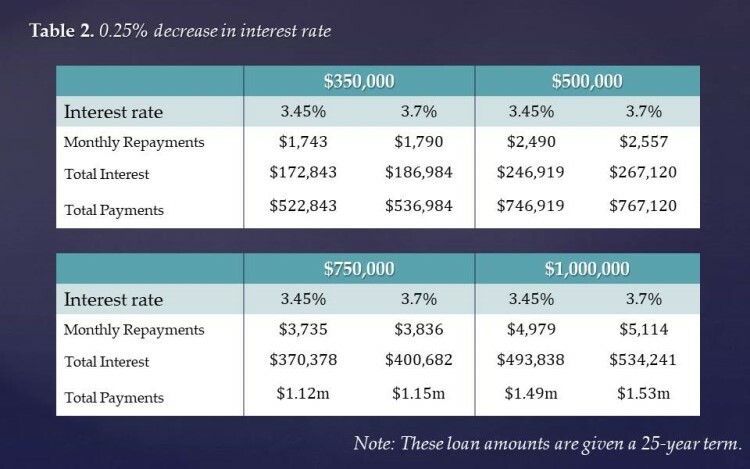 To illustrate how big of an impact a 0.25% change in interest rate means, YourMortgage prepared two tables which show the estimated total interest of different loan amounts set in 25-year terms. The tables also present the total amount of payments and monthly repayments required for each of the borrowed amounts. For instance, a $350,000 loan with a 3.7% interest rate will bear a total interest of $186,984 over the term. If the rate jumps by 250 basis points to 3.95%, the cost of the loan will increase to $201,334. Should interest rates drop by the same rate to 3.45%, you would be able to save roughly $14,000 over the life of the loan, which is actually a big discount. Refer to the tables again and look at how big the interest would be for a $750,000 home loan. At 3.75% interest rate, the loan cost sits at $400,687, which is actually already more than half of the total amount initially borrowed. Moving the rate upwards to 3.95% will result in the total interest jumping by more than 7% to $431,430. However, if rates go down to 3.45%, the interest of the loan would significantly be lower at $370,378. Comparison rates paint the bigger picture. The interest of the loan is just one of the many costs that you will have to settle when you apply for a mortgage product. Typically, home loans come with fees you have to pay upfront including establishment fees, valuation costs, government charges, conveyancing costs, legal fees, and the lenders’ mortgage insurance. Some home loan products might also charge recurring costs like service and annual fees. The comparison rate is your best friend if you want to weigh the overall cost of mortgage products. Not only does it incorporate the annual interest rate of the loan but it also takes into account all the upfront and recurring charges you have to pay all throughout. This means that you will have a rough estimate of the “true cost” of the loan. You may be attracted to a home loan with a lower interest rate, but the comparison rate will be able to tell you how much you would really have to pay for the loan including the other fees. Fixed-rate vs. Variable Rate: Which is a better home loan? Choosing between a fixed-rate home loan and a variable rate mortgage product is also a common scenario when taking out a mortgage product. If you want to shield your repayments for potential rate rises, you should opt for a fixed-rate home loan. Certainty is the name of the game for this kind of mortgage product, as it ensures that your repayments will be consistent for a certain period of time, usually up to five years. One downside of fixed-rate home loans is the inability to benefit should the central bank cuts official cash rates. You may also not be allowed to make additional repayments. On the other hand, variable rate loans provide you with flexibility. You can make additional repayments as you wish and you get to enjoy discounts should there be a drop in interest rates. The only downside is that in a high-interest rate environment, you will mostly be paying more than you expected. But if you want to enjoy both, you may ask your lender about split rates wherein only a portion of your loan will bear a fixed rate and the rest will get a variable rate. Consult a broker to get the best deal. While there is no doubt that you can do compare and choose the best mortgage product on your own, consulting a broker will allow you to broaden your set of options. A broker will be able to help you find specific mortgage products which have not only a friendly interest rate but also features that would suit your current home loan needs. Previous articleDoes My BMI Affect My Term Life Insurance Rates?